Imagine a vacation to the Bahamas — on tour of a tropical island such as the Staniel Cay tours — where turquoise waters fill the entire backdrop to your life. Where palm trees are the only obstruction to your view of a picture-perfect white sand beach scene. You have probably seen these kinds of scenes in movies, but never in real life; not until you have reached the paradisical Bahamian islands. As you are burying yourself in the warm sand with the Atlantic Ocean breeze blowing your hair gracefully behind, the last thing you will be feeling is regret for having taken a day trip to Bahamas with Bahamas Air Tours. Available Staniel Cay day trips are plentiful where our Bahamas tour takes you. Fortunately, you don’t even have to be on vacation in the Bahamas to take advantage of our five-star tours. If you are vacationing in Miami, it is a breeze to get over to the Exuma Cays. With Bahamas Air Tours day trips from Miami, you are afforded the luxury of entering a new country to go on one of the Staniel Cay tours. We wouldn’t let you miss one of the best parts of traveling to Florida which is the short hop and skip over to the Bahamas (and in a luxury private aircraft, too). Staniel Cay day tours available from Nassau! Staniel Cay is only one of the 700-plus islands that make up the archipelago of the Bahamas. Staniel Cay is located in the extra savory region of the archipelago known as the Exuma Cays. It is comprised of 365 out islands. Staniel Cay is located just under 75 miles south of Nassau and less than 250 miles southeast of Miami. Lucky for you, our 100% customizable Bahamas Air Tours itinerary will take you straight to Staniel Cay from one of Miami, Fort Lauderdale, or Nassau. There, one of the few landing strips in the out islands allows us to take you straight to Staniel Cay. 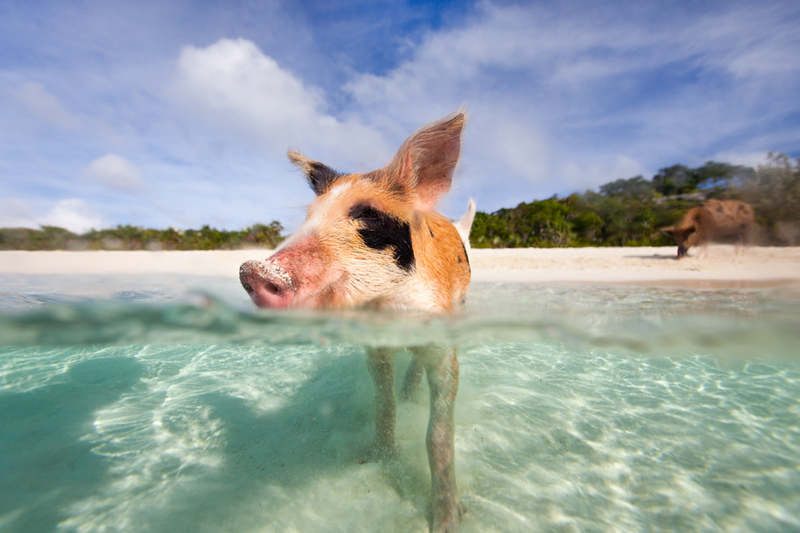 Arguably the most popular new attraction of the Bahamas, these pigs in the ocean are loveable, cute, and everything you could ever want. However, most tour companies who take you to swimming Bahamas pigs will take you to a replica beach or the original Exuma pigs. On our Staniel Cay tours, you will actually reach Big Major Cay (Pig Island) where the pigs on the beach are sure to brighten your day and make for an unforgettable Bahamas adventure. Not far from Staniel Cay, you can swim underwater with reef and nurse sharks on your Staniel Cay tours of the surrounding area. Every day, dozens of divers take the plunge into the turquoise waters of the Bahamas Cays and brave their greatest thrill. Mother and son swimming with nurse sharks. Many people believe Staniel Cay is not the place to go for great Sandbars. Actually, most people travel to Great Exuma to relax on sandbars. However, there are wonderfully appealing sandbars just a few miles away from Staniel Cay, too — and completely accessible by boat. To name a few: Sandy Cay and Twin Cays are nearby. Go even further to Scrub Cays to have a sandbar all but to yourself. Those that say Staniel Cay isn’t near sandbars must not be in the know. One of the most notorious destinations in the Bahamas, Thunderball Grotto, is only a few minutes away from Staniel Cay by boat. If you have never seen a photograph of this place on Instagram, you must have been living under a rock in the age of social media. The infamous plane was used for drug trafficking in the 1970s and ditched mid-flight in an attempt to elude authorities. It is one of the most accessible undersea plane wrecks in the entire planet. Many people train for years in order to dive down to an underwater plane wreck. However, this one can be found at less than twenty feet of water. The plane wreck is very near to Staniel Cay which is perhaps the most popular starting point for visitors to the plane. Join the Staniel Cay Tours in the Bahamas to see the most accessible sea plane wreck in the world! The three Bahamian Rock Iguanas and its seven sub-species are one of the main attractions of Staniel Cay. It’s one of few places in the Exumas where the iguanas can still be seen. Endangered species of iguana live only in the Exumas. The Staniel Cay Yacht Club is a perfect place to book all of your Staniel Cay Day trips’ excursions such as the reef shark or Bahamas swimming pigs experiences. Not to mention it makes an excellent place to escape the hot sun and be served a tall drink! One of the beautiful things about our day tour to Staniel Cay is that almost anyone vacationing in South Florida can conveniently take a Bahamas Air Tours Staniel Cay day tour. Simply clear a day in your Florida vacation or Bahamas itinerary and we will make it very simple for you. Whether you are in Miami, Fort Lauderdale, Nassau, or elsewhere — contact us and we will set you up right away! There are a number of reasons you should take you Staniel Cay Tours by way of plane. First and foremost, with Bahamas Air Tours, you will be invited to board a very exclusive nine-seater twin-engined private Bahamas aircraft. You will arrive at the island of your choice within the hour you left and will be treated to prime views of one of the most beautiful places in the universe. Each passenger gets their own window seat with a large window and the comfort of leather seats. Before leaving, you are afforded the opportunity to create your own itinerary. Bahamas Air Tours goes further than other tours to Staniel Cay — all the way to the out islands of the Bahamas — so, we want you to take advantage of that. A trip to the Bahamas by way of ferry or speed boat is not as dreamy as you would imagine. A plane provides a much smoother ride as the ocean is almost always rough on the six-hour round trip journey. Often times, schedules are even canceled or delayed due to the condition of the open sea. Even if your Staniel Cay Tours leave on time, chances are you will wish it never left — or better yet — you never bought a ticket! That’s because rides aboard the ferry are crowded and long. Rides aboard speedboats are also crowded and the fresh air and wind blowing your hair is not as nice when there is a passenger with sea-sickness sitting in front of you. By the time you actually get to the Bahamas, you won’t have enough time to see anything besides the beach they take you to — and it is a crowded beach. You’d be much better off flying to the Bahamas to get the most out of your time. Miami to Bahamas day trip is one of the top Florida attractions. Book Your Staniel Cay Tours Today! What are you waiting on? Astronauts have been quoted saying that the Exuma Cays of the Bahamas is the most beautiful view from above the earth the human eye can witness. Don’t you want to see for yourself? Book a Bahamas Air Tours Staniel Cay day tour to find out. We will take you places other Staniel Cay day trips cannot and that is a guarantee. With a fully customizable itinerary, it is your choice where we go; you have every control short of flying the Bahamas air charter yourself. We offer day trips to Bahamas Exuma Cays and tours to Staniel Cay coming from Miami, Fort Lauderdale, and even Nassau! Take a look at our tours and find which Staniel Cay Tours experience fits your family’s itinerary.